When Jerry and I had been married for about six months, I became pregnant with our son Jonathan. I was 22 years old and my dream was finally coming true. I was absolutely thrilled that we were going to be parents. Jerry was not exactly feeling the same way. Yes, my husband is a very practical man. It took a few weeks but he eventually came around. I spent the next six months vomiting my way from California to Florida to Maine as we moved three times while Jerry was in flight school with the Navy. It was a very difficult pregnancy. For the first six months I puked everyday. The doctors were so concerned with my losing too much weight so they put me on a special diet. The opposite happened. I gained back all the weight I had lost and a ton more. I was almost three hundred pounds by the time I delivered him. I was allergic to the amount of testosterone He was creating, which made me all puffy and filled with fluid. Then I was diagnosed with pre-eclampsia and they started monitoring my blood pressure. Needless to say, whatever could go wrong did. Whooda guessed, with six brothers I would be allergic to testosterone? IT’S all their fault! I prayed every day that God would protect our child and bring him into the world safely. 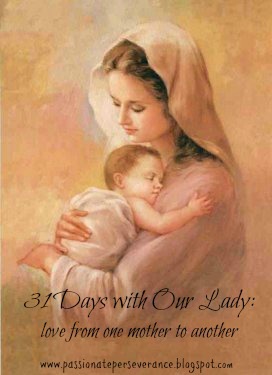 I used to imagine what the Blessed Mother went through during her pregnancy, riding on that donkey weeks away from delivering a child, not knowing how it would all come together. She gave birth in a cave, just her and Joseph, working through it together. Here I was with the best medical care, a clean room and a team of docs and nurses ready to help no matter what. If she could do it with nothing, than I was determined to make it through. It took thirty-six hours to birth my first child. There were some very scary moments when my blood pressure was too high and they almost had to take him by C-section. I prayed through it all. When I finally held him in my arms, I could not believe how lucky Jerry and I were that God chose us to be Jonathan’s parents. Then all those doubts that crush new mother’s dreams came flooding into my heart and it was a war from then on. Between love and trust and doubt and despair. I never expected to struggle with pregnancy and childbirth. I never expected to be terrified to leave him alone in case he stopped breathing. I never expected that I would be unable to nurse him or to feel so utterly exhausted for days on end, not even sure of what to do next. I never expected to love so deeply and so completely. I never expected to be consumed with his care, desperately trying to meet his every unspoken need, smiling when he did, crying when he did. I never expected the lump in my throat watching my husband hold and sing to our son. So many expectations, so few met but so many more exceeded. To be a mother is to watch your heart walk outside your body. You are vulnerable and relying on others to help protect him. It’s the hardest job on the planet but also the most satisfying. Mary did not have it easy. Just a day or two after giving birth to her son, she was once again on the back of a donkey on her way to Egypt, to make sure her son would live. Me? I was in a cushy little house with help. Even though our physical experiences were very different, I would imagine our heart experiences were very similar. Love. In the end it’s all that’s required of us as mothers. No matter our expectations or our doubts in our selves. All our children ask of us is love. Thank you for showing us how to love one another with the example of how you loved Jesus. You endured much in your young life and yet you kept your faith and persevered. You humbly placed your trust and faith in God and allowed him to guide your path. He placed Joseph in your life as your earthly protection and Jesus’s foster father. May we be inspired by the love and devotion you two had for one another on earth and continues in heaven. May we never doubt God’s plan for each of us or for our children. May we stay steadfast in faith always imploring your intersession on our behalf, through all the good and bad that comes our way. I love your posts that bring me to tears. You are beautiful.